Armed kidnappers seized Christophe André from his bed at the offices of Doctors Without Borders in the small Russian republic of Ingushetia in 1997. Loaded into a car, locked in a room, and handcuffed to a radiator, he was held for 111 days. 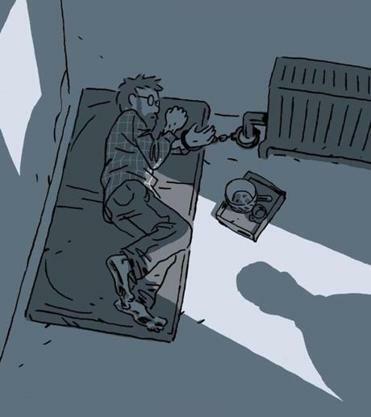 “Hostage” is the riveting story of his captivity as he recounted it to graphic novelist Guy Delisle. Delisle is known for his richly observed personal accounts of complex social realities and physical landscapes of major cities in his earlier graphic novels, such as “Jerusalem: Chronicles from the Holy City” and “Pyongyang: A Journey in North Korea.” He is the outsider, the witness, seeing and sketching the history, architecture, and conflicts of particular places through fresh eyes. In “Hostage,” someone else is the observer, and the landscape is largely confined to a small room and the interior monologue of a man wondering whether he will ever regain his freedom. It took Delisle and André 15 years to hone the narrative of “Hostage” and an intensive two years of drawing for Delisle to realize the narrative in graphic novel form. Their collaboration is seamless. From the first page, the reader is yanked into André’s overwhelming fear, uncertainty, and sudden confrontation with himself. Why has he been seized? Who are his kidnappers? What do they want? How long will he be held? How will he maintain his sanity while he waits? André’s account and Delisle’s art find common ground in understatement. There are no histrionics in the telling, no adornment in the drawing. As he tells the story of his ordeal, André speaks in short declarative sentences, chronicling his discomfort, his fears, his meager meals. Delisle’s rendering is masterfully simple, drawn in a loose flowing line and shaded with muted blocks of gray and green. His drawings of André, shackled by the wrist, staring out into a strange room, evoke the terror and tedium of captivity. In successive panels, slanting light from a small window works its way across a wall opposite the captive and gives him a glimpse of the passage of time. Muffled words in a foreign language filter through the walls of the apartment building where he is being held and offer clues to the rhythm of daily life. André clings to a sense of time. It allows him to maintain his balance. Even as his captivity stretches on and fills him with despair about his possible fate, that he can keep track of days and weeks and months grounds him in a sense of self and a world beyond his enclosure. His other resource is his memory, particularly his long-time fascination with military history. To quell his anxiety, he mentally retraces famous military encounters, including Napoleon’s victory at Austerlitz and Lee’s defeat at Gettysburg. Knowing that he did survive does not diminish the suspense or power of the reader’s identification with André’s agony and courage. He fantasizes about overpowering his captors during the few moments his handcuffs are unlocked. He worries his kidnapping will prompt his sister to postpone her scheduled wedding. He learns that his captors want a million-dollar ransom, and during a phone call arranged by the kidnappers to establish that he is still alive André pleads with his colleagues to refuse to hand over money that should go to completing the humanitarian organization’s mission. One of the most poignant scenes in the book revolves around a clove of garlic. His guards move André to a new location — a dimly lit storeroom filled with boxes and junk. On the floor, he glimpses a sheet covered with drying garlic. The handcuffed André desperately stretches so that one of his toes can grasp a clove. After weeks of a diet of weak broth and tea, biting into the garlic is an explosion of ecstasy. He hides it under his blanket so that he can eat it sparingly and extend its pleasures. As the story unfolds, André’s military reenactments achieve a greater resonance. Particularly when he is suddenly confronted with a real-time strategic dilemma and must quickly calculate which course of action is most likely to ensure his freedom and survival. The graphic novel format lends itself beautifully to the pacing of this story. Through carefully sequencing subtly shifting panels, Delisle evokes the incremental changes in André’s sur-roundings and the looping monologues that trace his battle to stay sane. The high-quality printing by publisher Drawn & Quarterly enhances the effect. Much of the action takes place in dark rooms and on unlit streets. The careful reproduction of the artwork preserves Delisle’s subtle gradations of shading to capture the murkiness and menace that define the world of a hostage — and life beyond. Dan Wasserman, the Globe’s political cartoonist, can be reached at dan.wasserman@globe.com.